Above: The Queen's Inner Hall in the Royal Palace. 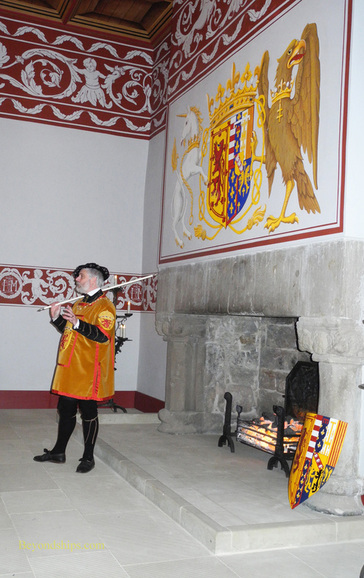 Above: Inside the Royal Palace, a guide educates visitors as to court life by re-enacting the character of Sir David Lindsay, royal herald in the time of King James V and Mary of Guise. 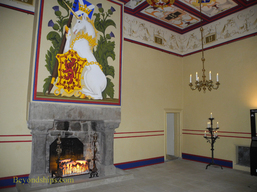 Below: Two of the unicorn tapestries in the Queen's Inner Hall. 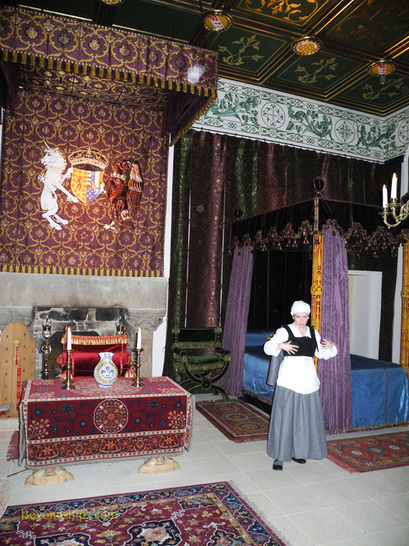 Above: A guide dressed as a servant of Mary of Guise remains in character as she describes the Queen's Bed Chamber. Below: A triptych in the Queen's Bed Chamber. 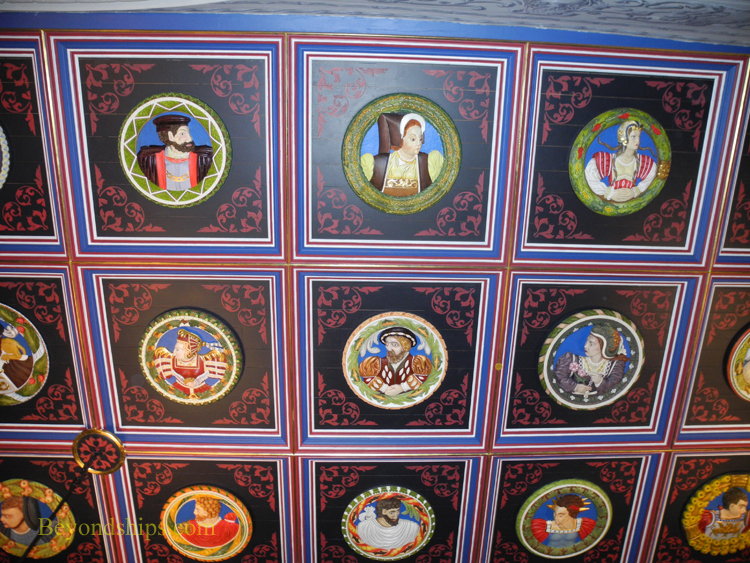 Above: Carved and painted wooden portraits decorate the ceiling of the King's Inner Hall. Below: The King's Inner Hall. The high point of a visit to Stirling is exploring the Royal Palace. This section of the castle was built by King James V in connection with his marriage to Mary of Guise, his second wife. Mary had also been married before, to a French duke. Her father too had been a French duke and she was used to the splendors of the French court and its nobility. James wanted a palace that was on a par with what she had known in France. It should also be borne in mind that this marriage was important as a matter of state. France and Scotland had long been allies and James wanted to continue this relationship. He was also aware that the English King Henry VIII had wooed Mary in hopes of disrupting the Auld Alliance. Thus, James wanted to impress upon people that he was a monarch of the first order and worthy of his new bride. Therefore, the Royal Palace was constructed and decorated in keeping with the highest standards of the time. While the Royal Palace is one of the best preserved Renaissance buildings in Great Britain, essentially nothing was left of its artifacts and décor after centuries of being used for other purposes. Consequently, a decade long program was undertaken; first to study what the Royal Palace would have looked like in the days of James and Mary of Guise and then to restore the palace. 12 million pounds were allocated for the project. The result is quite spectacular. Six large rooms have been restored. They are divided into the King's Apartments and the Queens Apartments. Each has an outer chamber, an inner hall and a bed chamber. These were used by the king and queen for audiences, dancing, entertainment and taking meals. Which of the rooms a courtier was allowed access showed his or her place in the court hierarchy. The restoration of the rooms involved an army of artists and craftsmen who painstakingly re-created the décor of the rooms. Surprisingly, the rooms are brightly colored and lively. One gets the impression from rooms and furnishings that have survived from those times that people chose to live with dull and muted colors. However, those examples have faded with the passing of the centuries. Renaissance people actually preferred bright colors. One of the most difficult projects facing the restoration team was replacing the Stirling heads. James had had the ceiling of his presence chamber decorated with portraits of some of the notable people of the time. These circular disks were made of carved wooden and were brightly painted. In 1777, after the palace had ceased to be a royal residence, the portraits were taken down and became dispersed. Out of the 56 that are believed to exist, only 33 are known to have survived. The surviving portraits were too delicate to re-attach to the ceiling of the King's Inner Hall. 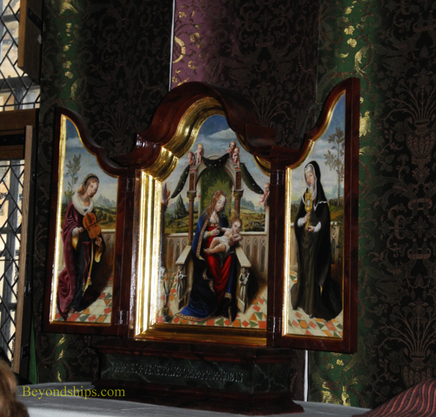 Instead, the restoration team carved and then painted replicas of the portraits. For the portraits that have been lost, the restorers relied on a book written in 1817 by the wife of the deputy governor of the castle, which had illustrations of the heads. 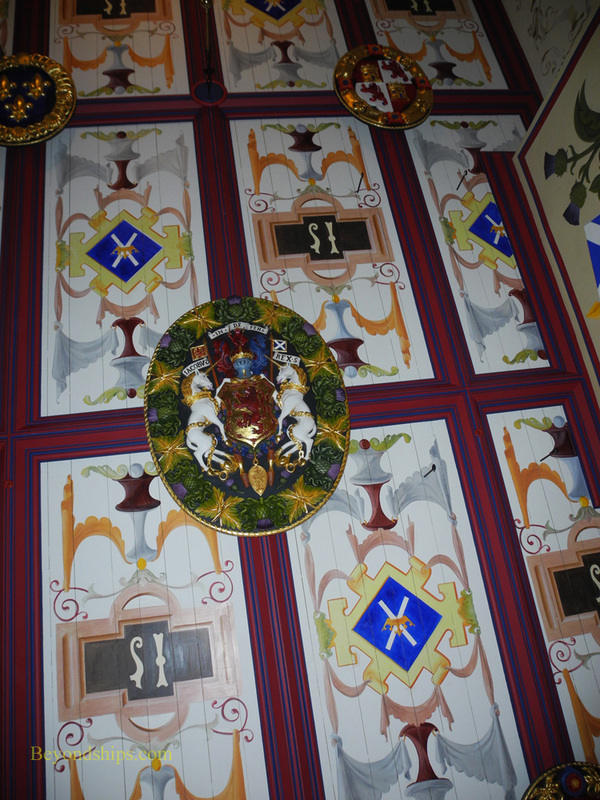 The replicas are now on the ceiling of the Inner Hall. The surviving originals are in a gallery on an upper floor of the palace. 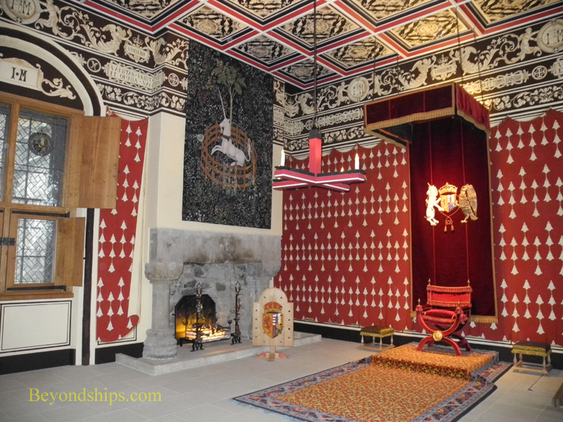 Another important project was the recreation of the tapestries that had adorned the palace. 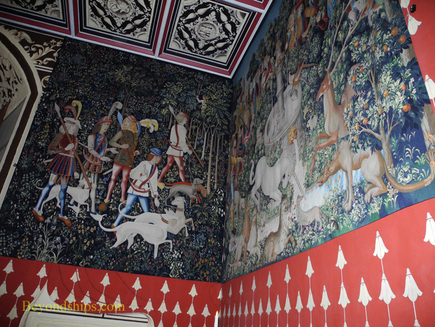 Tapestries were an important part of the décor in a Renaissance palace and James was known to have had two sets of tapestries which featured a unicorn. Thus, if the palace were to present an authentic Renaissance experience, it was important to have tapestries. James' tapestries had long since disappeared. So for a model, the restorers turned to a series of unicorn tapestries at The Cloisters, which is part of the Metropolitan Museum in New York City. A workshop was set up in the castle and another at West Deans College in West Sussex to weave new tapestries using Renaissance techniques. The project began in 2001 and is expected to be completed in 2013. However, those tapestries that have already been completed are on display in the Queen's Inner Hall. To further enliven the experience of visiting the Royal Palace, the castle has a group of guides who roam the restored rooms. Dressed in period garb, the guides adopt the characters of various members of the court during the time of James IV and/or Mary of Guise. At designated times, they share their stories with the visitors, telling something about the history of the palace and about the rooms. Remaining in character, they also answer visitor’s questions. These performances are not only entertaining but they make the visit more personal. As a result, you learn more about the subject matter than you would just reading a plaque. 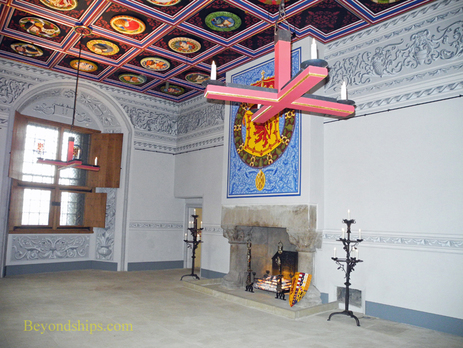 A visit to Stirling Castle is a very worthwhile for several reasons. First, it is scenic and picturesque. Second, it is a place of historic importance. Third, it has been restored in a scholarly way to produce an authentic experience. 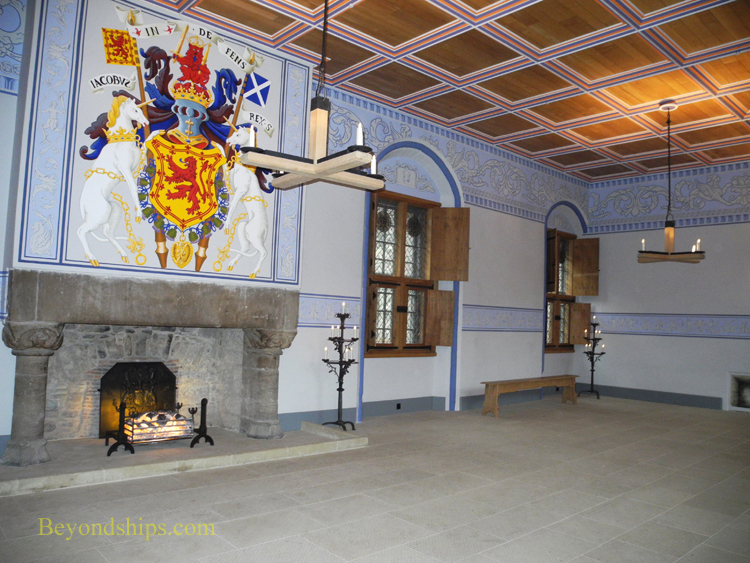 Finally, thanks to Historic Scotland who operate the castle, it is an entertaining learning experience.